It is an mid-October weekend at the port of Mykonos. The sky is cloudless and a pleasant breeze is blowing as I have a coffee with a friend in the tourism accommodation rental business.I watch hundreds of tourists disembark for the day from three huge cruise ships and wonder how many of them will visit the small nearby islet of Delos instead of the tourist Mecca’s famous beaches or the picturesque alleys of the main town, Chora, flanked with international designer clothing stores, bars and restaurants. “The Saudis and Lebanese who have been coming here in large numbers over the past few years send us e-mails asking whether the hotel or villa they’re interested in renting is close to [the upscale beach resort of] Nammos rather than Chora,” my friend said. 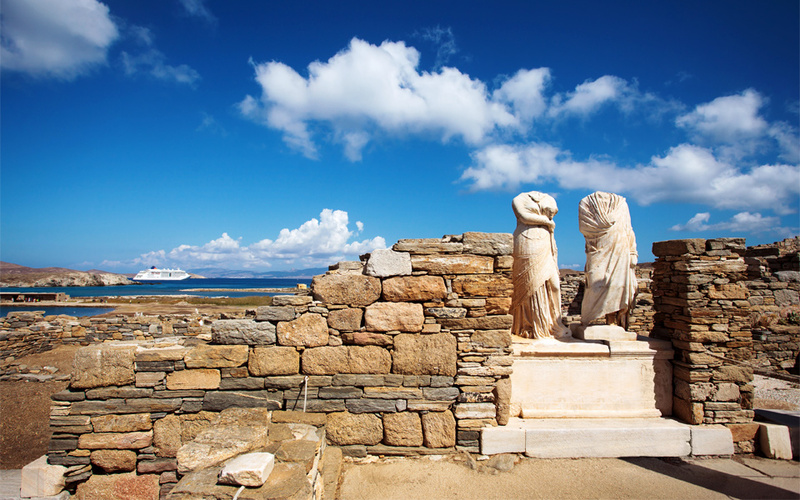 According to the Ephorate of Classical Antiquities for the Cycladic Islands, an average of just 120,000 tourists visit the stunning archaeological site of Delos each year – less than the 130,000 a month received by Mykonos and extremely low compared with the 600,000 visitors every year at Akrotiri and the other archaeological sites on Santorini. Leto was desperately seeking a place to give birth to Apollo and Artemis after Hera, enraged by Zeus’ infidelities, ordered that she be forbidden entry everywhere she appeared. Leto traveled from Thrace to Kos, until she spotted a small, inconspicuous floating rock in the middle of the Aegean, Delos. Poseidon anchored his newly formed island to the seabed with diamond pillars and Leto gave birth to Apollo and Artemis on it. The two young deities filled this tiny dot in the Mediterranean with life and light, allowing it to grow into one of the most sacred sites of the Aegean. 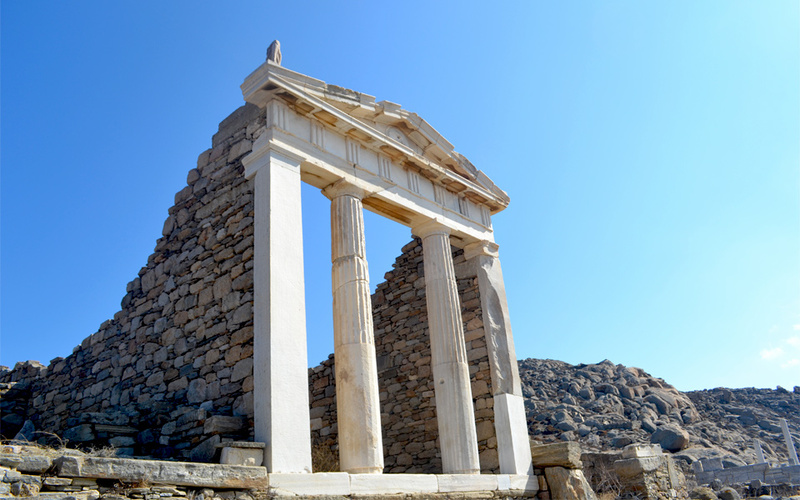 The first permanent residents of Delos have been traced to around 2,500 BC, though many centuries elapsed before the island experienced a golden age, which began in 166 BC and lasted about a hundred years. The Romans, the dominant force in the Aegean, decided not to charge levies at the port, making it a tax haven for wealthy merchants and bankers from all around the known world. The new-found wealth and the settlement of rich entrepreneurs soon led to a blossoming of the arts, letters and philosophy. It is estimated that in its heyday, this island of just 5 kilometers in length and 1.3 in width was home to around 30,000 people, settlers from Athens, Rome, Cyprus, Syria, Egypt, Thrace, Medea and many other places. Their gods also resided on the island in harmony. 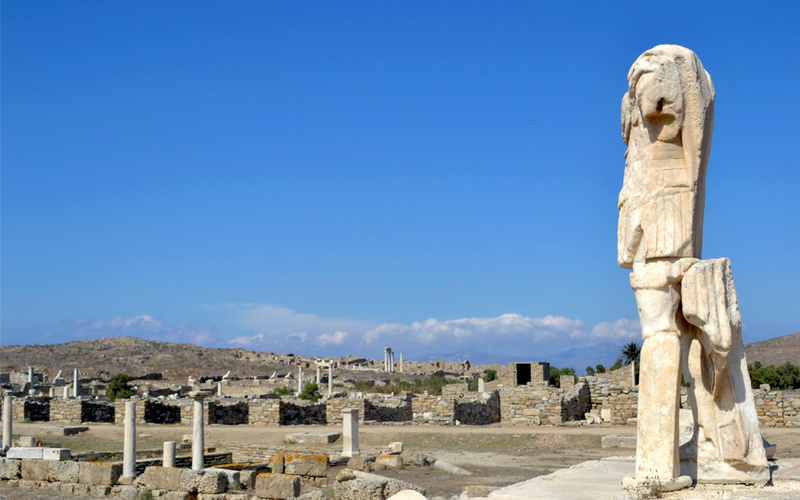 The island’s attachment to Rome came at a heavy price, however, and in 88 BC, Delos was sacked by Mithridates VI of Pontus, who was at war with the Romans, and looted in 69 BC by the pirates of Athenodoros. While it never managed to make a comeback, there are few examples in the history of mankind of such ethnic diversity, harmonious coexistence and moderation as existed on Delos during its golden age. Asians are great lovers of the ancient Greek culture. The boat ride from Mykonos to Delos takes about 25 minutes. 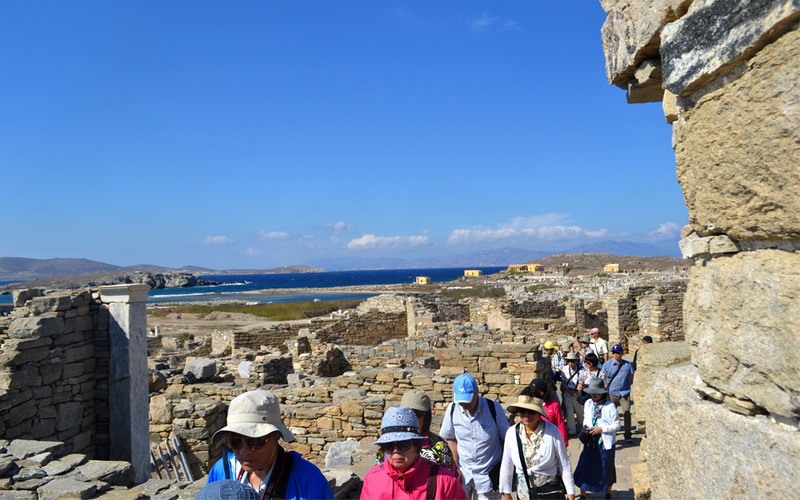 The majority of visitors in October are from Asia, mainly China, who opt for the cooler months to visit and who have a great love for ancient Greek culture. Delos is a unique site, an enchanting place where even the natural light feels different, otherworldly and mystical, with an indescribable energy that seems to envelop you. However, it is as enthralling in its beauty as it is in its abandonment, especially given that it lies so close to one of Greece’s richest and most glamorous islands. 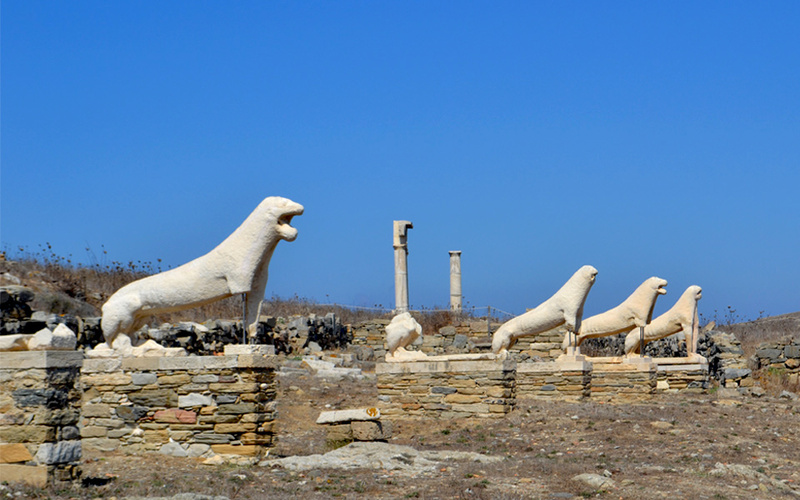 Among the many problems that dog Delos today is the poor state of its museum. Built in the early 20th century, it is not only small and extremely old-fashioned but also suffers from poor maintenance so visitors are greeted by peeling ceilings and walls and the sight of the glorious Naxian Lions sitting in a small, dimly lit room as though they’re being punished. A rudimentary gift shop located at the museum’s entrance was closed during my Sunday visit and there was not a trash can in sight, meaning that the small bottle of water I paid 2 euros for at the snack bar had to be discarded either on the boat back or on Mykonos. The Temple of Isis, built at the beginning of the 2nd century BC, still contains the cult statue of the goddess. The biggest problem that has remained unsolved for years, however, concerns the people who work there. There are not enough guards and staff, they do not have an on-site doctor and their accommodation and facilities are seriously shoddy, meaning they have to deal with everything from leaky plumbing to being cut off entirely from Mykonos during the winter months for days at a time. Before the start of this year’s tourism season, it took the private initiative of a contractor on Mykonos to get the site cleaned up and ready for the spring/summer arrivals. He loaded two trucks, a crane and a crew onto a ferry boat and got Delos spruced up in just one day. Given the magnitude of the country’s growing problems and the state’s empty coffers, it is very likely that Delos will again be closed from November this year as the emergency staff sent to the site this season are due to leave at the end of October and it will be left with just two guards. Such issues of day-to-day management have brought the site’s future into question and one of the people trying to find solutions is Dimitris Athanasopoulos, head of the ephorate for the past year-and-a-half. He recently organized an event on Mykonos to raise awareness about the state of the site among the island’s business community and has also reached out to municipal authorities and residents who have shown an interest in contributing to the effort. Things will begin to change with the realization that what will benefit Mykonos even more in the long term is improving its quality profile, something that can be achieved in part by lending a hand to its small neighbor, which needs all the help it can get. The Anenue of the Lions, that had been dedicated by the Naxians in the late 7th century BC. At the event organized by Athanasopoulos earlier this month, French archaeologist Jean-Charles Moretti, director of French excavations at Delos, presented “L’Atlas de Delos,” that was 11 years in the making and which presents a detailed representation of the site. This is not only significant for its contribution to science but is also a valuable digital tool that can be used by archaeologists in studies for the site’s restoration. Athanasopoulos also spoke about an ambitious program called “Archipelago Plus,” which will include major interventions at six museums in the Cyclades as well as the restoration of the Stoa of Philip V on Delos. What makes this stoa special is that archaeologists have already found around 80 percent of the original building material, which is quite impressive considering that the Stoa of Attalos in Athens was restored with just 40 percent of the original material. The program was first pushed forward by former minister of culture Nikos Xydakis, who launched the drive for private funding, and it is now waiting for approval from the sponsor of the project. Another positive development is the creation of a festival titled “A-Delos/Delos,” which took place for the first time earlier this month. Privately funded, the plan is for the festival to be held annually and to draw an international audience. One of the highlights of the first festival was the screening of a 25-minute documentary-ode titled “Delos 2015,” directed by Andonis Theocharis Kioukas and featuring actor Georges Corraface. The score is by Platon Andritsakis, with Constantinos Arvanitakis behind the lens and Thaleia Kalafata as production director.